+ was so happy my brother and sister in law were able to babysit our kids. 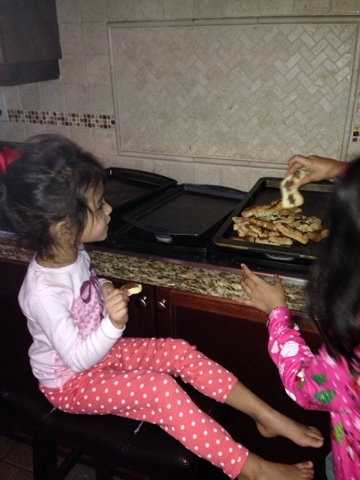 + did some baking with my girls and nephew. Those were the softest, cakiest, messiest sugar cookies ever. + snuggled with my nephew and taught him to answer "who's my favourite aunt?" 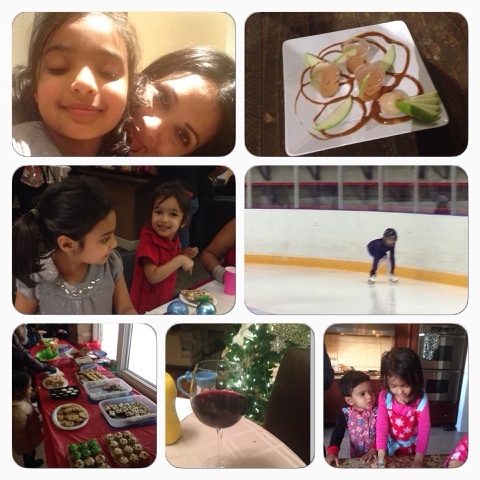 + went to a holiday party complete with festive parang, yummy trini food and fun for the kids. And just like that it turned to Monday and look what I found this morning? Yeah, my kids are having cookies for breakfast but it's seriously less sweet than a muffin and it's four days before Christmas. Happy Christmas week, friends! Really is the MOST wonderful time of the year! Cookies for breakfast sounds just fine to me!! Merry Christmas week! Sounds like so much fun! I love the idea that you each had to bring two drink ingredients to your party. The grown up party sounds like a nice night out. Hope you have a wonderful Christmas this week! cookies for breakfast are TOTALLY fine the week before christmas, they have to get their little bodies ready for all of the sweets they are going to eat in the next few days, right! just preparation! ;) so cute! What a fun little contest. I hear you on the to old to mix drinks part. Now days I just stick with beer, lol. I like to feel alive the next day and not like I may die. Mixed drinks- the craziest I get is champs and OJ ;) Cookies for breakfast are definitely appropriate this time of year! If cookies for breakfast is wrong, I don't wanna be right! Also, love that idea of a mystery basket, chopped-style drink contest. What was in your guys' winning concoction?